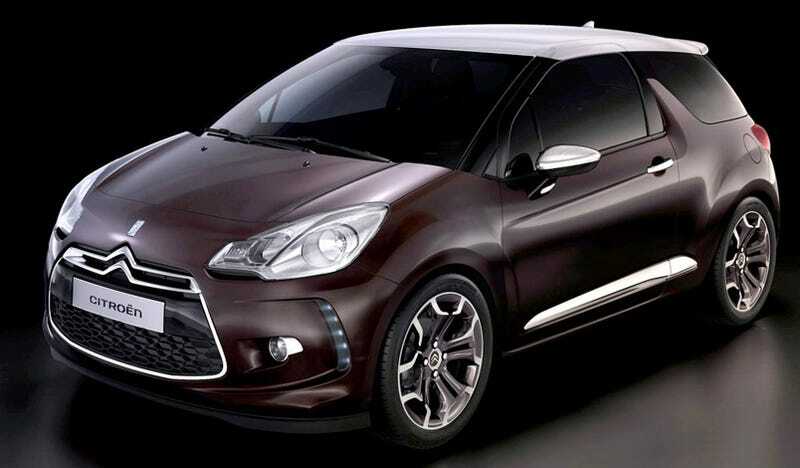 Images of the Citroën DS Inside Concept leaked out the other day, and aside from giving us a peek at the forthcoming Citroën DS3, it also signals a reinvention of Citroën itself. The Citroën DS Inside Concept will be debuting at the 2009 Geneva Auto Show in March and offers us a peek at the direction the company is going with its just announced, revived DS line, starting with the DS3, the bigger DS4, and top-of-the-line DS5. All these cars will be positioned as a premium alternative to the standard Citroen lineup. We don't have any details on the DS Inside concept at the moment, unfortunately, but it will come in due time. We will say we're a bit disappointed in the styling, given the name's history. Along with the DS Inside, Citroen is announcing something of a personal reinvention. It has committed to a changed relationship with its dealerships, its customers and a new commitment to product. This reimagination of Citroen begins even with the brand logo, which has been designed as a pair of chrome boomerangs and goes all the way through to redesigned dealerships. On the product front they're saying we should watch out for product influenced by the Citroen Hypnos concept and the Citroen C-Cactus concept. If Citroen manages to follow through on all the promises made in the release below, it should be a pretty significant shift in perception. We'll see if it comes to pass. Today, at 90 years of age, and on the birthday of its founder, Andre Citroën, French car manufacturer CITROËN is turning a new page in its history, and begins a global brand project that encompasses a new visual identity, a new relationship with its customers and an exciting new line of automotive products. In a difficult economic climate, and in a period of changing relationships between customers and brands, CITROËN is taking action and reinventing itself. The Marque aims to pursue the excitement generated by the success of its products launched over the past ten years, by enhancing the CITROËN brand to strengthen and support the range. Developed jointly by CITROËN's Marketing and Styling teams, headed by Jean-Pierre Ploué, and the Landor agency, an international branding and design network, the logo is the first visible sign of change. The chevrons have broken free from their frame and become three-dimensional, gaining in strength and body. Bridging CITROËN's past and future; the colour red is used for the new brand name typography. The red assumes a new, deeper tone. CITROËN strongly recognise the alliance between creativity and technology; being the first to propose Stop & Start technology, on the CITROËN C2 and C3. It also leads the European market with its automated manual gearboxes and has pioneered particulate filters. The Marque illustrated its ecological and economical commitment in 2008 by confirming its European leadership on vehicles emitting 110 g/km of CO2 or less, thanks to the CITROËN C1. Rather than aiming for pure technological exploits, CITROËN innovates for the benefit of its customers. It invented Hydractive suspension, the wide-angle panoramic windscreen, and new driving aids such as the lane departure warning system. It has also developed new designs with maximum use of space, as seen on its latest new model, the CITROËN C3 Picasso. CITROËN has the boldness to completely rethink the automobile. The CITROËN C4 Picasso has transformed the segment, becoming the leading model in its class in 2008 and going on sale in the first-quarter of 2009, the CITROËN C3 Picasso has the same ambitions. With the new CITROËN Berlingo Multispace, launched in May 2008, and CITROËN Nemo Multispace, coming in early 2009, CITROËN will have a range of five, renewed MPV vehicles, making it the standard-setter in this segment. For the future, the CITROËN Hypnos concept car heralds diesel hybrid technology and the CITROËN C-Cactus is a new vision of the automobile. CITROËN's new advertising strap line is Créative Technologie. Written in French, identical worldwide and rich in meaning, these words form the basis of the new advertising strategy. Every advert demonstrates the promise of the brand and the benefits for the customer, whilst remaining playful and optimistic. For the first time since 1983, the Marque is launching a new advertising campaign co-developed with Agence H, a subsidiary of the Havas group. Today CITROËN is introducing new graphic designs, a single typography and a unique tone of voice to boost the visibility and consistency of the brand. The new brand will universally reflect the Marque's new status. The key colours are white, denoting openness and elegance, and red, to express vitality, together with black, grey and chrome, for status and power. A full 70% of customers who walk into a CITROËN outlet today have visited the brand website beforehand to find information. The www.citroen.co.uk website, the initial contact point between the Marque and its customers, will now fulfil a compass role, pointing web users to local sales sites. To ensure the consistency of all media, CITROËN is applying the new visual identity to its 20 European websites on the morning of 6 February, using cutting-edge full 3D technology for all web communication concerning the new image. CITROËN will enter a new internet era starting in the second-half of 2009, with a new European web strategy. CITROËN has entered the motor sport history books with four World Rally Championship Manufacturers' titles and five WRC titles for driver Sébastien Loeb and co-driver Daniel Elena. Coinciding with the Cyprus Rally, CITROËN Sport is changing its name to CITROËN Racing. The specific qualities of WRC – speed, vitality, impetus – are incorporated in the new CITROËN Racing logo. To enhance customer relations and their experience of the brand, CITROËN is transforming its international network of sales outlets, including showroom, reception, sales and maintenance areas. Outside, transparency, fluidity and colour provide simple and immediately recognisable points of reference. Inside, the customer experience has been entirely redesigned to lead customers naturally to the services they are looking for. As part of the ever-present CITROËN world, dedicated areas highlight the expertise of the Marque's functions. The new architecture concept was selected from 12 shortlisted projects by a jury made up of CITROËN's main managers and the Landor agency, as part of an international competition. The winning project embodies the Marque's ambition and makes the brand adaptable to all network conditions, whatever the location, layout and level of investment. Over the next few years, CITROËN's 8,000 sales outlets will be transformed so that customers all over the world can take pleasure in visiting their CITROËN outlet. CITROËN is implementing the new sales outlet architecture internally through an international network of architecture representatives and externally through a designated network of architects. CITROËN already inaugurated this new architectural spirit at C_42, the brand's showcase on the world-famous Champs-Elysées. Some two million people have visited C_42 since it opened in September 2007. The customer's experience of CITROËN has to be outstanding in all circumstances. To this end, the Marque has implemented a set of customer commitments in both sales and aftersales - "The Building Blocks ". These include: taking care of customers immediately and on an individual basis; providing fast and clear answers; ensuring personalised vehicle handover and presentation; respecting lead times; giving explanations of work carried out; and follow-up afterwards. 1. You are welcomed within three minutes. 2. Internet information requests are answered within 24 hours. 3. Your needs are clearly identified. Adapted products and services are presented systematically. 4. You are offered a test drive, spontaneously and systematically. 5. You receive a formalised and personalised sales proposal or a completed order form. 6. The salesperson thanks you, sees you to the door and says goodbye. 7. You are given a reliable delivery date and informed immediately of any change. 8. The vehicle is delivered in perfect condition and complies 100% with your order. You are advised on use and maintenance. 9. You are contacted no more than 5 days after handover to check you are happy with your vehicle. 1. You are welcomed at the exact appointment time. 2. The protective items on your vehicle are fitted and removed in your presence. 3. A complete vehicle inspection is made in your presence. 4. You are informed of the work to be performed and presented with an estimate. 5. You are given a reliable time and notified of any changes in vehicle work (delays, extra work, etc.). 6. Your work is carried out as requested. 7. You receive an explanation of the work carried out and the invoice. 8. You are advised on vehicle maintenance and any future work to be planned. 9. You are contacted no less than 5 days after your workshop visit to check you are satisfied with the work. To achieve this breakthrough on service quality and respect these commitments, CITROËN has a quality policy based on taking after-sales into account in product design, new accounting methods and network training courses, and the exchange of best practices. These best practices are being rolled out through a lean management approach, operational for ten years in PSA Peugeot CITROËN plants and applied today in sales outlets. CITROËN's objective is to make its network a standard-setter on service quality. The Marque regularly measures performance and has shared objectives: to rank among the best carmakers in multi-brand surveys on purchase, delivery, servicing and repair, and to rank top-five in JD Power annual surveys. CITROËN is enhancing its policy and launching CITROËN Select, 34 years after the launch of the Eurocasion label in Europe. * a strengthened range of services, including a warranty extension for vehicles over seven years old. o a new image of used vehicles with an international dimension. To implement this new used-vehicle strategy, CITROËN developed an optimised organisation structure in 2008, with centralised management of the used vehicle business for the entire Marque and new tools and methods for the network. The objective is to increase our distributors' share of used vehicle sales compared with new vehicle sales and to boost the satisfaction of our customers, transforming the used-vehicle business into a growth lever. The Marque has developed CITROËN Business to respond to the specific needs of professional customers. CITROËN Business is a range of targeted products and services provided by specialist salespeople in dedicated areas. CITROËN is leading this sales offensive with a view to increasing brand sales to professional customers, and sales of passenger cars in particular. This policy is already showing results. In 2008, thanks to the success of the CITROËN C4 Picasso, the new CITROËN C5 and our renewed range of LCVs, CITROËN reported a 0.4-point increase in its share of car and LCV business sales in the seven biggest European markets, France, Germany, Spain, UK, Italy, Belgium and the Netherlands. In Sales, salespeople are trained and 100% dedicated to professional customers, and LCVs are displayed in dedicated, clearly visible areas. In After-Sales adapted opening hours are offered, dedicated contact people and phone numbers, a commitment to maximum wait times for workshop appointments, and the systematic proposal of a mobility solution in the event that a vehicle breaks down or remains off the road. Alongside the profound changes in its sales outlets and customer commitments, CITROËN is also thoroughly transforming its product strategy. CITROËN today has the largest and most diverse range in its history. It will continue to differentiate its models, and at the same time accelerate their arrival on the market. Over the next three years, CITROËN will launch six new models in Europe, at a sustained pace of one launch every six months. The customer expectation is changing; this is why CITROËN is launching complementary product strategies, corresponding to the kind of change its customers are looking for. The first approach, consisting in satisfying fundamental mobility needs, addresses customers who, having down-sized, are on the look-out for more economical – and more intelligent – products. Some would describe this as low-cost, but it isn't. The real challenge for CITROËN is designing products that are less expensive but with no loss in appeal. This approach is perfectly illustrated by the CITROËN C3 Picasso, a real recession proof car. And, going forward, our CITROËN C-Cactus project will be an even more accomplished solution. In contrast, the second approach favours motoring pleasure, with no loss in practicality. Customers here are looking for outstanding products that confer status and bring them an all-new automotive experience. They want prestige, thrills and refinement, without the rigid codes of traditional upper-range models. To address this need, CITROËN is today launching a new line of products to broaden its current range. The new line will consist of three new cars, positioned in the small, medium and large car segments, launched successively from 2010. The first illustration of this new product line is the CITROËN DS INSIDE concept car. The concept car and vehicle line are characterised by forthright choices on styling, onroad performance and use. These are accessible objects of desire, cars that stand apart by their creativity, intelligent design and build quality, embodying the very best of CITROËN. The new product line will perfectly illustrate CITROËN's new spirit of "Créative Technologie". The new line will also have a new naming system. Like the main range vehicles, which carry the letter C and a number, and, like the MPVs, which sport the Picasso signature, the new models will feature a special name: the DS line. DS stood and continues to stand for a new approach to automobiles and the future. CITROËN is taking inspiration from its design DNA to strengthen the positioning of its new product line. The range instills the different spirit, that the name DS inspires. Hence the distinctive model line up will be called DS3, DS4 and DS5. DS: Different Spirit. IV – February 2009: A new era. CITROËN plays a starring role. Each season at C_42 sheds new and spectacular light on the world of CITROËN. C_42 has become one of the trendiest destinations on the Champs-Elysées, drawing some two million visitors since opening in September 2007. The Marque's international showcase has now been completely transformed for a very special season. The interior is illuminated by a 20-metre high screen revealing CITROËN's new brand image. Each floor of this outstanding building takes visitors on a sensory tour of the new brand strap-line, "Créative Technologie". With the CITROËN C-Cactus concept car, displayed on the ground floor in an electric version sporting the new chevrons, CITROËN is exploring new design paths. Through maximum weight reduction, new architecture and new materials, the Marque is pointing to a new kind of mobility, one that is responsible and optimistic. An interactive experience awaits visitors on the first floor, where they get to take an urban journey using Stop & Start micro-hybrid technology, which reduces fuel consumption and CO2 emissions by more than 10% while improving acoustic comfort. On the second floor, visitors can configure their very own CITROËN using a "multi-touch" table, gaining fuller insight into the Marque's colours and materials universe. Also on display is a CITROËN C5, fitted with intelligent traction control technology, and a CITROËN C3 Picasso, the latest expression of the Marque's creativity. Visitors also get to experience a panoramic vision of the CITROËN C4 Picasso with an onboard camera. Arriving on the top floor, visitors are treated to a range of sensory experiences focused on well-being in the CITROËN Lounge, while taking in a magnificent view over the Champs-Elysées.